Adrianne rolled her ball across the floor. It bounced off the wall and rolled back to her. Since she had nobody to play ball with, she played by herself all day long. Adrianne's father worked at a shop. He sold food, mouse traps and tools. Sometimes he kept crates at home, especially if there was no room in the back of the shop. One afternoon Adrianne went into the garage, where her father kept the crates. She threw her ball at them and it bounced off and rolled back to her. “This is fun! The crates are stacked him so the ball bounces higher.” Adrianne tried to hit the bottom crate and then the one above it. She threw the ball so hard that it went behind the crates and she couldn't find it. “Who said that?” Adrianne looked behind the boxes. Nobody was there. 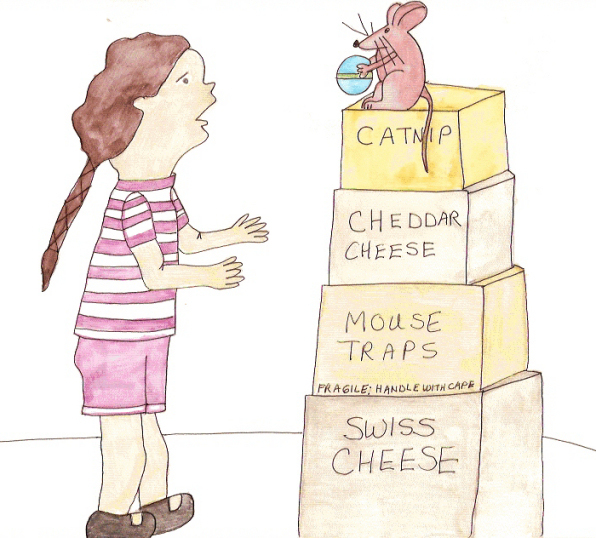 When she lifted her head she saw a plump brown mouse sitting on top of the box of catnip. “You found my ball!” In its tiny paws it held the blue ball. “You need to be more careful where you are throwing this. I was taking a nice nap when the ball hit me.” The mouse tossed the ball at Adrianne. “I'm sorry. I'll tell you what. If you will play ball with me, I'll open the box of Swiss cheese and give you some.” Adrianne wanted someone to play with. “Hi, Marmaduke. Let me open the crate.” Adrianne found a crowbar and pried open the lid to the Swiss cheese. “That smells heavenly,” the mouse said. Adrianne gave him a big chunk. He gobbled it down. “I want more,” Marmaduke said. Marmaduke sighed. “All right.” He picked up the ball and rolled it across the floor to Adrianne. She rolled it back. He rolled it back to her. This went on for hours. Finally Marmaduke was so tired that he closed his eyes and fell sound asleep. From then on Adrianne made sure that she only gave him crumbs and food from inside the house. Both were happy from then on.